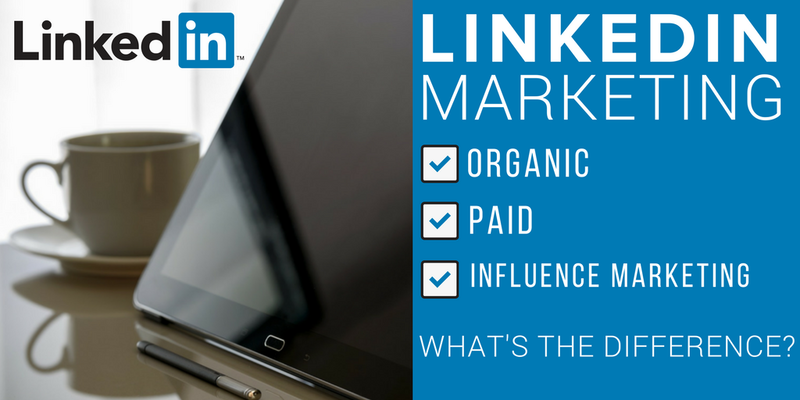 LinkedIn Marketing: What's The Difference Between Organic, Paid and Influence Marketing? LinkedIn Marketing: What’s The Difference Between Organic, Paid and Influence Marketing? I have been using LinkedIn since 2004, but it was only in 2014 that I understood the power of LinkedIn. Having been active on the b2b social network since 2008, I realise now that I wasn’t fully utilising all that it had to offer. Who knows what i would be doing right now had I realised the power of LinkedIn marketing this sooner! Everything has changed. The internet, Social Media communication and business models has all evolved as we have become more intelligent as marketers. Since LinkedIn was acquired by Microsoft for $26 billion, they have been making some drastic changes around the user interface as well as adding and removing features in both the free and paid versions of LinkedIn. Did you know that 94% of B2B marketers use LinkedIn to distribute content? I’m one of the 94%, and you should be to. The way we use Social Media and more specifically LinkedIn marketing has evolved. We, as marketers could use LinkedIn to push content, and send our connections over to our website. The way we need to market to potential customers is through understanding what THEY want, and the way they want to receive it. In other words WHERE they want it. LinkedIn is more than just a place to find new staff members, connect with work colleagues and find other businesses to help solve a problem you might have. I’m going to share, and show you three different ways you can market your business and that’s through generating organic traffic, (natural visitors to my profile and website every single day), paid traffic that drives target users to a specific marketing campaigning i’m running at that moment (that I pay linkedIn for every click through) and influence marketing. If you’re not sure what that means, you’ll have to keep reading. So let’s get into the difference between organic, paid and influence marketing as well as giving you my top tips to LinkedIn marketing success. I have over 300 articles on LinkedIn Pulse, and have over 15,000 content followers. LinkedIn Pulse has been an amazing traffic and revenue driver for me especially over the last five years. It has taken me nine years to mould my personal writing style so that I can stay consistent with the content I share. LinkedIn Pulse is a great place for me to engage with my audience whilst also increasing my presence as a thought leader. More than a million LinkedIn users have been posting on Pulse, with over 130,000 posts being published every week. One of the best ways you can utilise Pulse is to get featured on their channel. To make this a possibility, use your keywords in the title of the blog, and in the content you create. You can also reach out to them on twitter via @LinkedInPulse and ask them to feature your content in a specific category. Remember that LinkedIn Pulse is completely free of charge for you to use, so make sure that every article you write on your website, gets re-purposed and shared on LinkedIn Pulse for maximum exposure. At the end of last month, LinkedIn introduced a brand new feature called Custom Audience. 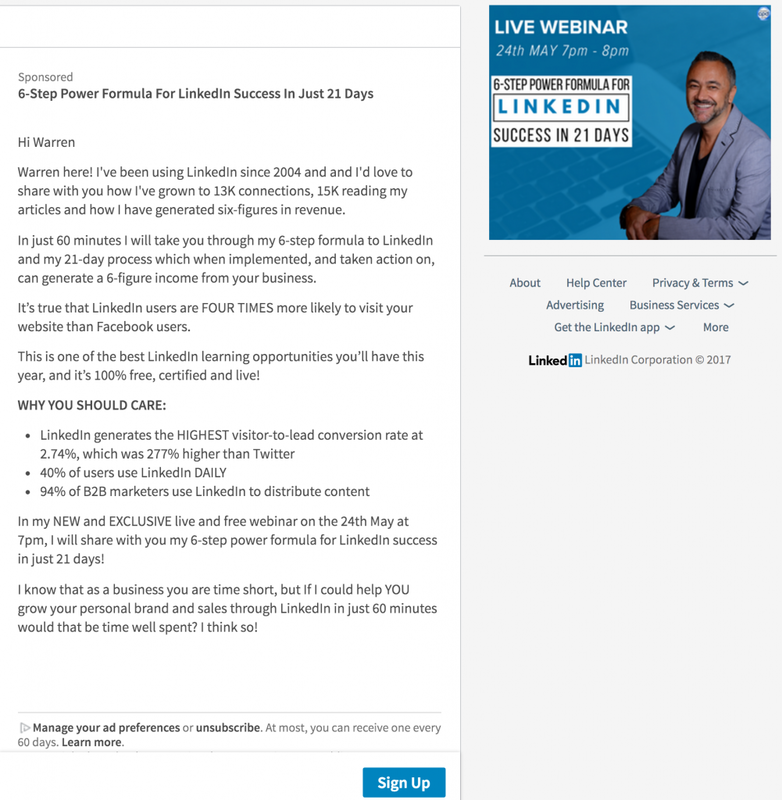 I have been testing this tool since it has launched, and have seen that 18% of my webinar signups have been through the use of LinkedIn’s InMail Sponsored feature. The InMail paid feature is a great way to reach your audience inside of their inbox in a more personal and direct way. The reason why I have decided to do this, is because I am connected with thousands of LinkedIn users, and I can’t connect with every single one through the content I share, so spending money and re-engaging with them inside of their InMail allows me to give them what THEY want. You will also find three other features inside of Custom Audiences which can be used as a part of your LinkedIn Marketing; Website Retargeting, Account Targeting and Contact Targeting. 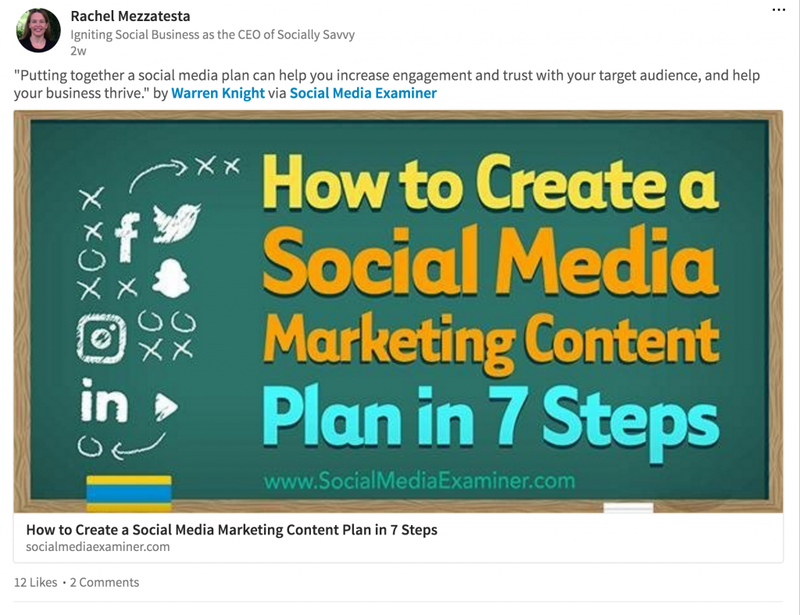 At the end of April, I guest contributed to Social Media Examiner and wrote a piece of content on creating a Social Media content plan in 7 simple steps. This article has received over 5,400 shares and has sent my Twitter notifications into overdrive. The most powerful thing about being a guest contributor on such an influential website is that when someone shares it, I then get tagged in the post. Whilst the link someone shares will send them to the article, it has my biography at the bottom with links back to my website which has already proved extremely powerful for me, and I have been contacted by various industry influencers with potential collaboration opportunities. Now that you understand the difference between LinkedIn marketing and how organic, paid and influence marketing can help your business thrive online, let’s take this one step further. Join me on the 24th May at 7pm to find out how I built a LinkedIn community of over 13,000 connections, 14,500 content followers and daily engagement that attributed to a 6-figure income. Sign up below to access the recording.